Cucullia heinrichi Barnes and Benjamin, 1924, Contrib. Nat. Hist. Lep. N. Am., 5(3):132. Diagnosis: Cucullia heinrichi is a distinctive species in an obscure sort of way. 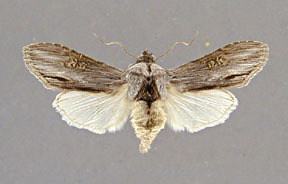 Its closest relative appears to be incresa and like incresa the color of the hindwing is sexually dimorphic; pure white in males and dirty brown in females. The characteristric features of the species are; 1) the forewing maculation is obscure and in particular the orbicular and reniform marks are almost entirely absent, 2) sexual dimorphism of hindwing color exists, 3) a large, triangular frontal protuberance is present (as in incresa), and 4) the prothoracic tibial claw is shorter and more triangular than in any of the preceeding three species. The male genitalia are distinctive. A strong dentate band is present on the basal diverticulum of the male vesica. 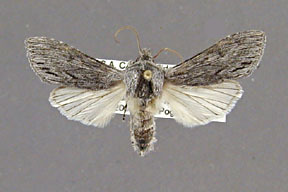 This band is present in eulepis and cuculloides but absent in incresa. A strong dentate patch exists next to one of the vesica spines. The apex of the valve is pointed, not rounded, and the clasper is short. The uncus is greatly swollen about one fourth the distance from its pointed apex. 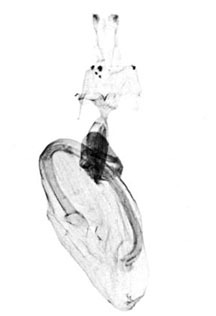 The female genitalia are equally distinctive with a well developed v shaped sclerotization of the ostium. 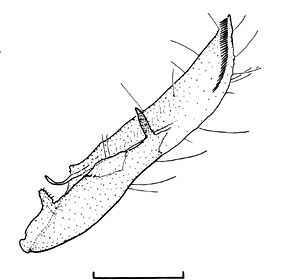 The specialized scales in the membrane of the seventh abdominal sternite are very weak and the membrane between the seventh and eighth sternites is not nearly as thick or as leathery as it is in antipoda and incresa. Wing length from base to apex: mean = 16.75 mm., standard deviation = 0.42 mm., n = 6. 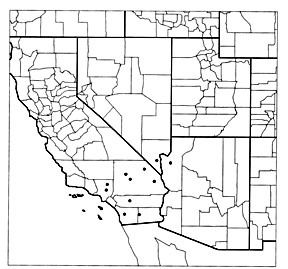 Distribution: This species has been collected in Mohave County, Arizona (the type locality) and San Diego, Los Angeles, Riverside, and San Bernardino Counties in California. All of the known localities are in the Mohave Desert. The few dated specimens are from February and April.